Thanks to In-Mould Labelling, it is possible to show the texture of the ice cream in razor-sharp photo quality on the packaging. This is complemented by the striking purple colour of the lid that catches the consumer’s attention. Overall this smart look of the EasySnackingTM pot makes the product stand out on shelf. In addition to these powerful colours and smooth design lines, the integral spoon of the handy EasySnackingTM pot is a key feature for Taice. The spoon is neatly separated from the ice cream, and easy to grasp under a tear-off label in the lid. 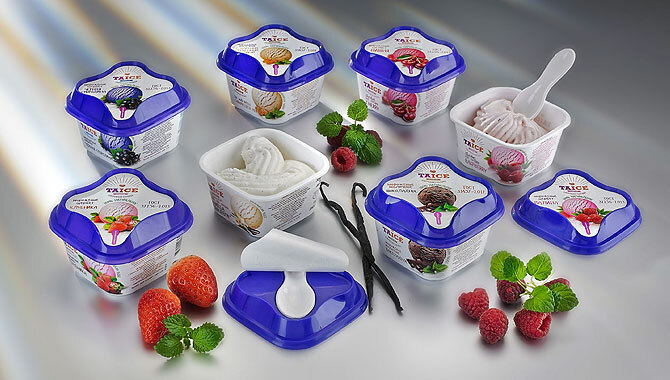 Taice made the vital packaging decision in collaboration with Denis Komarov, the company representative at UnipakCentr.